Coastal pine forest on the north side of the Tsengwen Estuary at Qigu: a hotspot for rare migrants. Waders: 28 wader species were seen. Counts are extremely approximate (100s = “hundreds”!). I stopped in for mainly brief visits to Cheting, Qigu, and Budai, but I spent much longer at Aogu. The above highlights list says it all; this was a superb weekend with quite staggering numbers of some wader species, plus an excellent sprinkling of non-wader scarcities and just generally some damn good birding. If only it could be early May all year round. To make things even better, the above birds were merely the bread in a Fairy Pitta sandwich, the main reason I headed to central Taiwan this weekend. But more on that later. I headed north from Kaohsiung early on Saturday morning, and a 10-minute stop at Cheting provided a gentle warm-up. On the main lagoon, there were a couple of Greater Sandplovers, some Red-necked Stints and Sharp-tailed Sandpipers, and a lone Curlew Sandpiper. The latter bird was a precursor to at least a thousand more seen during the course of the weekend; its description as an uncommon migrant in Brazil’s book Birds of East Asia seems to be very inaccurate, at least as far as the west coast of Taiwan in early May is concerned. Next, onwards to Qigu; a breeding-plumaged Chinese Egret strutting around in front of the Black-faced Spoonbill center was an excellent find, my tenth individual Chinese Egret of the spring. There were also around 25 Terek Sandpipers here, a bird I didn’t see at all at the other wetland sites this weekend. Further north again, and a couple of stops in the Budai area produced 9 late Spotted Redshanks, a couple of Eastern Black-tailed Godwits, and two Ruddy Turnstones. Nothing to get the pulse racing just yet, but very enjoyable birding and plenty of lovely breeding-plumaged waders to look at. I was excited for my first visit to Aogu wetlands, an oblong of land that juts out into the sea in Chiayi County. It’s a big area and unfortunately, not knowing any better, I wasted a fair amount of time in the interior, which is covered mainly with eucalyptus and other trees interspersed with occasional marshes. There were a lot of common birds in there, but the only species of note was a Barred Buttonquail (year tick) beside one of the dirt roads. Finally, I found my way into the sea wall, which skirts the entire perimeter of the area and has a convenient road running along its entire length (and even some birding hides). This was nice easy birding, just cruising along on the scooter and stopping to scan with the pools through my scope whenever wader flocks were seen. The marshes and pools here are quite extensive, and birds were truly abundant; probably the total number of Curlew Sandpipers I saw here today outnumbered all my previous sightings of this species put together. I didn’t see any real rarities the first day, but several Red Knots were around (Taiwan tick) and a single Great Knot. It felt a little odd searching for the very scarce Dunlins among the Curlew Sandpipers; growing up in England, the opposite scenario was always the case. 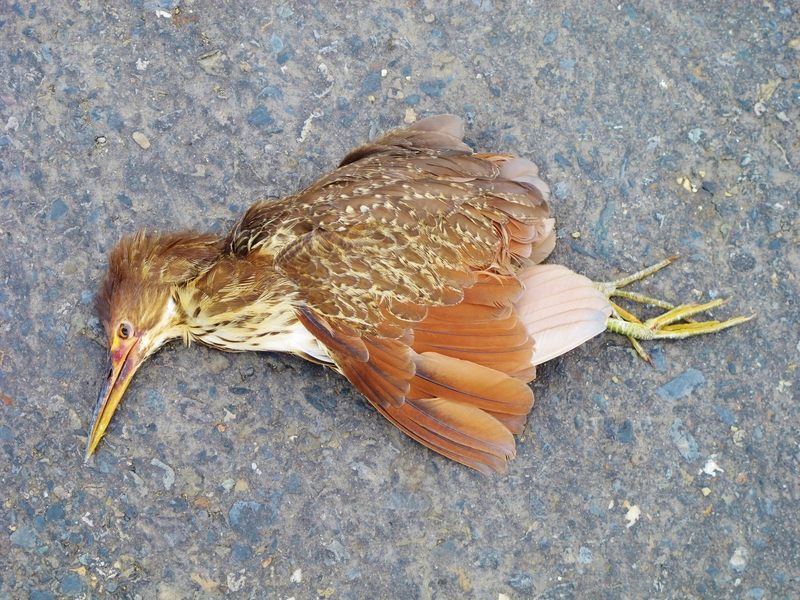 Female Cinnamon Bittern, sadly found recently dead on the road near Budai. On the second morning, I finally found the rarity I was looking for: a superb breeding plumaged Asian Dowitcher, showing at quite close range. After enjoying this bird for a while, I proceeded along the embankment and just 200 yards later encountered a tour group of British birders. I showed them the dowitcher, which was a lifer for one of the group; there’s nothing better than finding a rare bird and being able to share it with others for once. This is a very unusual scenario in Taiwan, where I virtually never run into other English-speaking birders. Finally in Aogu, along the north side of the embankment, an area of scrub, murky ponds, and dried-out reedbeds produced a few oddities; a twice-flushed Savanna Nightjar, an Oriental Cuckoo, a Black-faced Bunting, and two flyover Black-shouldered Kites. 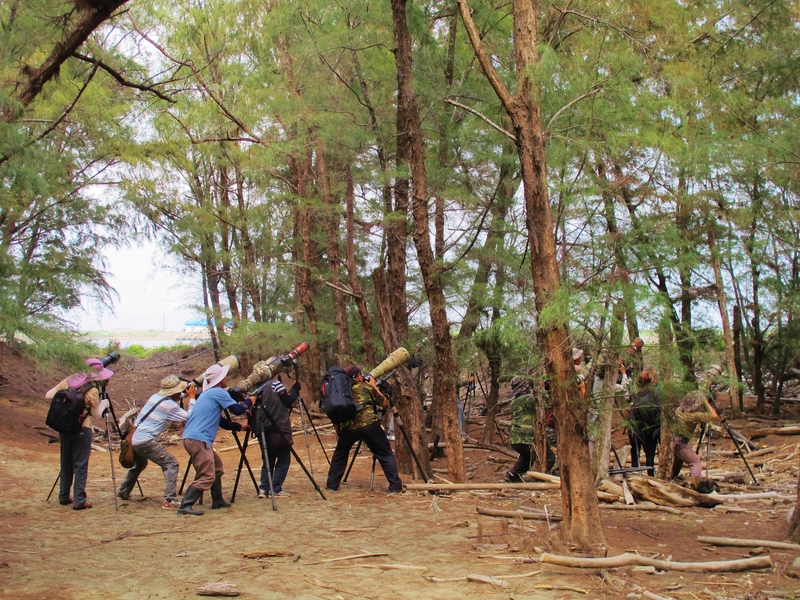 Photographers watching one of the two Ruddy Kingfishers present in coastal forest at Qigu, May 4th. By now it was 1pm on Sunday, and it was time to leave and start making the long drive south towards Kaohsiung. As I passed near Qigu, on a whim I decided to make the 20-minute roundtrip detour from Highway 17 and call in there again. The tour group of British birders was just leaving the Black-faced Spoonbill hide as I arrived. 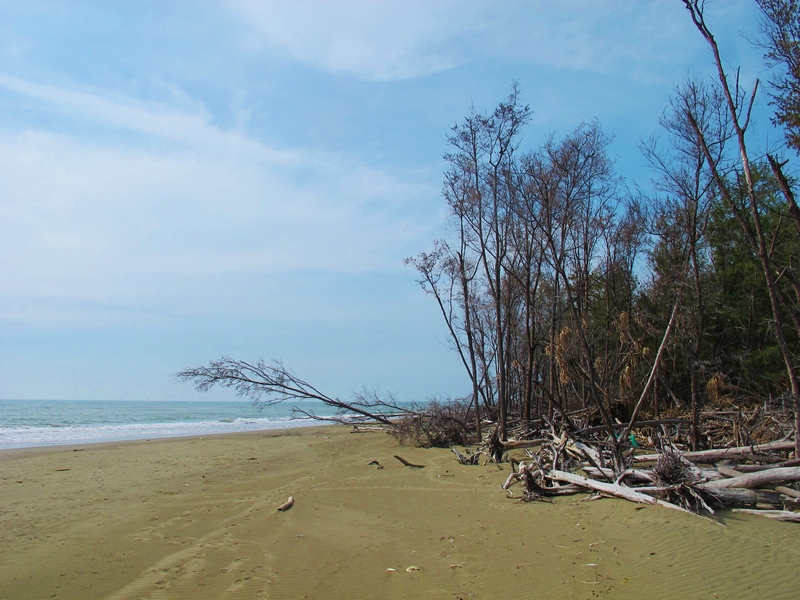 They hadn’t seen much from the hide, but were headed to an area of coastal forest nearby that sometimes produced rare migrants: a narrow belt of pine trees and driftwood, literally on the white sand beach at the northern mouth of the Tsengwen River. We weren’t alone in this Robinson Crusoe-like setting today; the presence of about 50 excited bird photographers, and easy banter with the British birders, reminded me strongly of birding the north Norfolk coast. The photographers were there to see the two Ruddy Kingfishers that were present – this is not only a Taiwan rarity, but is also an extremely attractive bird, hence the large numbers of photographers. We also saw the long-staying Asian Paradise-Flycatcher here, a common SE Asian species that is a rare migrant in Taiwan. An Arctic Warbler and two Brown-headed Thrushes also showed themselves in the pines, plus a mystery bird that, on the very brief flight glimpses obtained, appeared to be an unusually chestnut-colored accipiter. Taiwan ticks: Asian Dowitcher, Red Knot, Ruddy Kingfisher and Asian Paradise-Flycatcher. Year tick: Barred Buttonquail.